The Pri Plajerju farm stands near the forest on a terrace above the Soca River with a beautiful view of the valley and the mountains. The Pretners raise sheep and goats, so you can enjoy mutton and kid dishes and try sheep and goat milk. They also have excellent salami, you can spread minced lard on bread, and vegetarian dishes are also available. Holidays along the Soca River are active holidays, and you can choose from hiking, mountain touring, climbing, fishing, hunting, horseback riding, whitewater rafting and kayaking, and paragliding–all in the immediate area of the farm. In the evenings, you can sit outside and listen to the roar of the river and the murmuring of the wind while your hosts tell of the traditions and customs of the Trenta Valley. Holidays along the Soca River are active holidays, and you can choose from hiking, mountain touring, climbing, fishing, hunting, horseback riding, whitewater rafting and kayaking, and paragliding - all in the immediate area of the farm. The Triglav National Park information center is only a kilometer from the farm, and the alpine botanical gardens are four kilometers away. Activities in the area include hiking, skiing, cross-country skiing, horseback riding, tennis, golf, swimming in river or lake, indoor swimming pool, archery, sauna, bicycling, paragliding and fishing. De bergen en de rivier nodigen uit tot actieve vakanties. U hebt de keuze uit bijvoorbeeld wandelen, paardrijden, mountainbiken, paragliding, raften, kajakken, en vissen, allemaal in de directe omgeving. 's Winters is het mogelijk om vanaf de deur aan een langlauftocht te beginnen. 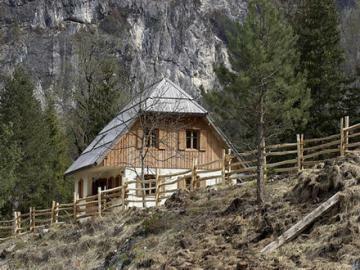 Het huis is gelegen in het Nationale Park Triglav. Het informatiecentrum van dit park is slechts een kilometer van het huis. Op een afstand van 4 km is er een botanische rotstuin te bezichtigen.